Musical notes and symbols are music party themes for musicians and music fans. 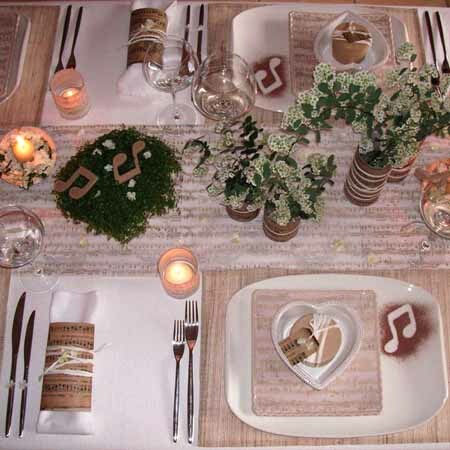 Table decoration ideas that include clefs, accidentals and music note symbols, combined with creative green centerpiece ideas, candles and interesting dinnerware create festive and pleasant ideas for kids and adults who enjoy music to celebrate birthdays and special events. Creative and artistic people can turn party table decorating into an amazing adventure, using unique themed party decorations that look like clefs, accidentals, dynamics and musical notes symbols. 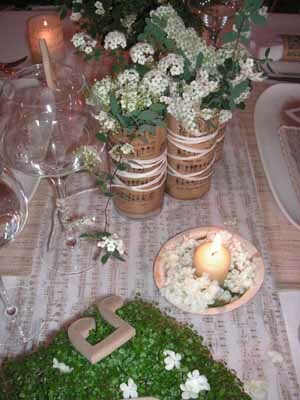 Wooden table decorations blend well with green table centerpieces, tender white flowers and candles. 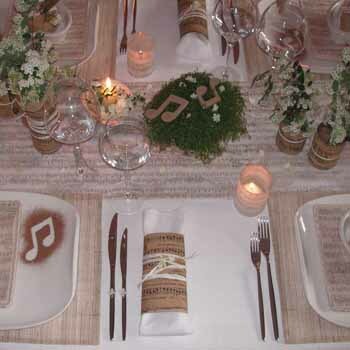 Elegant dinnerware in neutral colors and white-n-black music pages are complimented with skillfully created green table centerpieces. Relaxing colors, decorative candles and soft table decorations look impressive and classy with soft classic music or jazz. Romantic and tender green, brown and beige color combination look gorgeous with glowing small candles light. 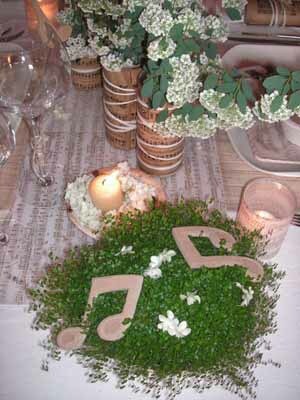 Beautiful table decoration ideas, inspired by music theme, unusual music decorations and organic combination of white, green and brown colors create unforgettable music theme decor and party table settings. 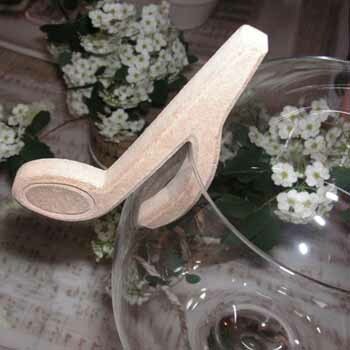 Sentimental and meaningful music themed party decorations and table centerpiece ideas in modern retro style create amazing table decoration that guests and your family members will admire and enjoy. Music themes party decorations, made of wood, felt or paper, can look like G clefs, F clefs, quarter notes, eighth notes (crochet, quaver) or beemed notes, decorating plates, tablecloth, candle holders and table centerpieces. Made of paper, eco friendly felt or wood letters pp (pianissimo,) p (piano,) f (forte or mf (mezzo forte) are great music themed party decorations which can add meaning and unique character to table decoration ideas. 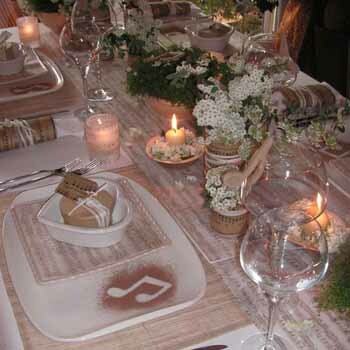 Elegant underplates, music themed tablecloth with musical notes and symbols, musical notes, clefs and accidentals, made of paper, fabric or wood, old music note pages, small candle holders, white ribbons or sisal twine and green branches with white flowers are main elements of attractive and eco friendly music themed decorating ideas. Simple plates can be used as underplates, – nice flat plates on which another deeper dishes are placed before serving, placing them under soup plates, coffee cups and saucers. 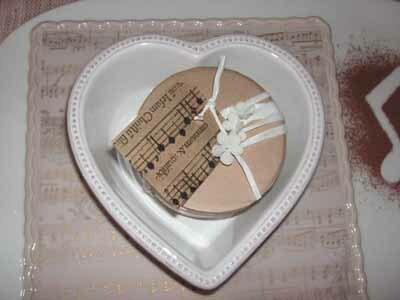 Old music note pages or selected composers music pages are perfect theme decorating ideas. Colorful wrapping paper with music notes and symbols or white-n-black old music pages are great for mini gifts, candle holders and napkins decorating. 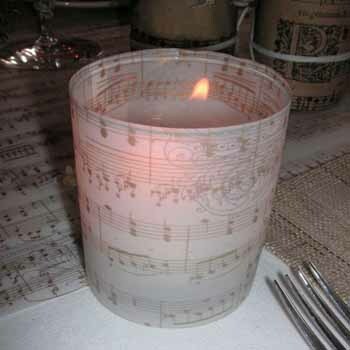 Musical notes and composers names, printed on tracing paper that is used for decorating candle holders is another simple idea that adds a lovely touch to music themed decor, bringing soft glow into the room. 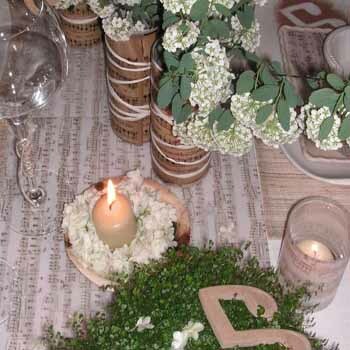 Small green branches with white flowers look amazing in tiny vases and on the tablecloth, adding tenderness and elegance with striking white-green-beige color combination to music themed party table decoration. 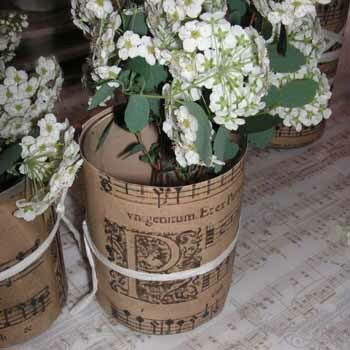 Various in size and design blooming flower centerpieces with green branches add a splash of pleasant green color and stylish eco accents to musical party table decor. White flowers on green grass finish the look, creating bright and festive atmosphere.